New executive/luxury cars for 2013 | What Car? There's little wrong with the current 5 Series, but BMW will launch an updated model next autumn. The main changes will be cosmetic most likely new bumpers, and tweaks to the light lenses and front grille along with new infotainment systems and interior trim. There are no details of any mechanical changes, but we expect revised engines with improvements to efficiency and emissions. Currently, the most efficient version is the 520d ED, which emits just 119gkm of CO2. It remains to be seen whether BMW will choose to standardise the 5 Series' Variable Damper Control (VDC) system. An option for the current car, it vastly improves ride and handling. Although BMW has added xDrive four-wheel-drive cars to the 1 Series and 3 Series ranges, there are no plans to introduce 5 Series xDrives to the UK. These models are available in other markets, but BMW says right-hand-drive models have not been engineered to accept four-wheel drive. The new Bentley Flying Spur will give the brand a much more competitive rival to the Rolls-Royce Ghost and range-topping Mercedes S-Class models when it goes on sale in the autumn. More flowing lines echo the Mulsanne saloon and conceal lighter mechanicals. The car will also get a version of the Continentals 4.0-litre V8 petrol engine, and probably an update of the current W12. The new, smaller engine should mean a lower starting price than the current Continental's 133,200. Maserati doesn't launch new models very often, but the Italian marque is going to introduce two all-new saloons in 2013. First to arrive in spring will be the all-new Quattroporte. Itll be longer than the current model, providing more rear legroom and making it a proper S-Class rival. Power will come from V6 or V8 petrol engines, and higher-powered cars will be available with four-wheel drive for the first time. In autumn 2013, Maserati will launch the Ghibli, a smaller saloon rival for top-end BMW 5 Series and Mercedes E-Class models. It's understood to be based on a shortened Quattroporte platform, and will be the first diesel-powered Maserati. Prices are likely to start from around 55,000. 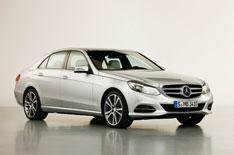 The Mercedes E-Class saloon is getting a 2013 makeover to keep it up to date with its rivals and upcoming versions of the C-Class (2014) and S-Class (2013). The current four-headlamp design has been replaced by single-lens units, complemented by new bumpers, light lenses, bonnet, tailgate and grille. Those distinctive rear wheelarch curves have gone, too. Just one trim level Avantgarde is offered, and two new four-cylinder petrol engines have been added to the range. Prices will go up slightly, but all versions will be better equipped.